I must admit, I didn’t have high hopes for the show. It wasn’t hyped up that much and I thought with everything that’s happened over the Xmas and New Year period, ticket sales might not have been great. I was wrong. Sorta ya kicked off the night. I never really get my hopes up about DJs as a lot of them seem the same to me but she knew what she was doing. She blended tracks effortlessly and really knew what yo play. Some tracks went off and though the crowd was only about 1/3 of the way packed in, they were going crazy. The main track that the crowd really got into was Sheck Wes – Mo Bamba. But that definitely got the crowd hyped for the next act. The Australian rapper, Carmoflauge Rose has jumped the ditch with Rae Sremmurd off the back of the Australian leg of FOMO festival. The crowd had grown a lot more by this point and as soon as he came out he was back and forth across the stage. He jumped down into the crowd and just had so much energy. It seemed as though he was losing his voice a bit but that didn’t seem to hold him back. There were even some people in the crowd who knew his music and were front row screaming the words with him. Carmoflauge Rose even got the crowd to create pits and do a small wall of death. I didn’t know how music but I definitely have to say, I am a fan now. He also covered a bit of Sheck Wes. After Bay Dreams I thought THIS SONG IS EVERYWHERE. But really the crowd didn’t care and went just as crazy as they had when Soraya played it. I think he is definitely someone to keep an eye on and I’m glad Auckland got to experience what he has. But the crowd was there for 2 people, Slim Jxmmi and Swae Lee, also known as Rae Sremmurd. After last playing The Studio here in 2015, they are now at Logan Campbell Centre and who knows where they might play if they return. But I honestly couldn’t tell you all the songs they played as they really just pumped it out. It felt like about 20 or more. It was insane. Obviously, they played the hit songs you’d expect like Black Beatles and even their recent collaboration with Post Malone, Sunflower. The energy was crazy. Logan Campbell Centre was packed upstairs and downstairs, with some under 18’s jumping from the seats to be amongst the pit below. Rae Sremmurd also called for mosh pits as well and I’m not surprised they got them. Slim Jxmmi even grabbed a couple of phones to video for the fans at the front, Swae Lee joined in on a couple too. Those fans must be freaking out. They had visuals on a screen behind them to accompany each track. 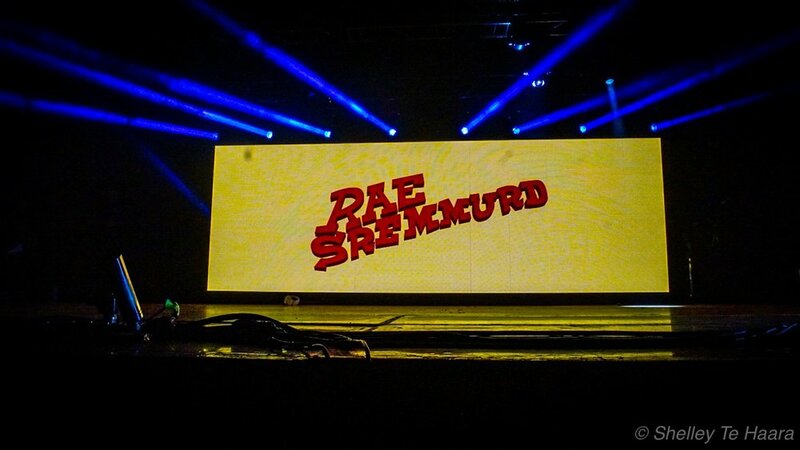 From some bold coloured imagery to images of money, lyrics and obviously their name, Rae Sremmurd. They ended the show with a bang of blue shiny confetti. I really feel like it was a show you had to be there to experience. Hopefully, the photos help show you how hype it was. If you’ve ever been on the fence or been curious I recommend checking them out. They exceeded my expectations and I hope to see them return to our shores again.